There is a Winter Weather Advisory around much of the Midwest tonight. I LOVE it! There always seems to be an excitement that builds in me whenever I hear those words. Snow is so beautiful to watch. So calming and peaceful. I have a fire in my fireplace and a warm drink in my hand just WAITING for the first flake. I am almost embarrassed to admit this, but I went shopping earlier this evening and bought a new pair of boots in anticipation of this evening's event. I should clarify that I already have more boots than Imelda Marcos. But there is a certain energy that comes from the phrase" it might snow". 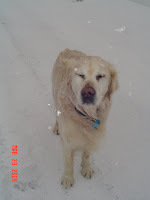 I have retriever dogs that love the water, and snow is no different. They love to play in the snow, and it's always entertaining to watch. My car, on the other hand, isn't as good of a sport. But that's ok. It's worth it just to see all of those beautiful flakes coming down. I might even have to go play in it with my dogs!